It seems fitting that SLS3 sent me their newest print in compression socks to review with BUTTERFLIES! I've been wearing these socks as much as possible in the past few weeks and I'm impressed. Long runs, tempo runs, speed workouts, and recovery runs have all been pretty tough on my legs. I looked forward to wearing these all day long, during runs, and after running. I wish I had three pairs of these socks so I could rotate through them and not have to wear stinky socks. Which, I admit, I did do a few times. In comparison to some of the other compression socks I've worn, these socks feel a bit more tighter around heal and foot, which I needed during this last training cycle. I had some issues with my achilles feeling tight, and when I wore these socks, the pain disappeared. The price for the Butterfly Compression socks is right around the same price as many other compression socks available ($54.90 with free shipping). In addition, they come in three different colors - Azure Blue, Violet, and Hibiscus Pink. There is only one drawback to these socks. And it's quite minor. They were a tiny bit long. But after readjusting a little and pulling the sock down more into the foot area, they fit great. Sebastian and Sylvie, two German, pro triathletes, met and fell in love. Together they created SLS3 which began with only a few products. A majority of their products are produced in the United States and they strive for the highest quality athletic apparel and gear. SLS3 just revamped their website. You should check it out and all of their products. They have quite a few to choose from. Since they are Sebastian and Sylvie are triathletes, they do specialize in tri race apparel, so if you are a triathlete or someone who is going to take on your first tri, you need to check out what they have. Like SLS3 on facebook or follow them on twitter and tell them Jen from Running With The Girls sent you! 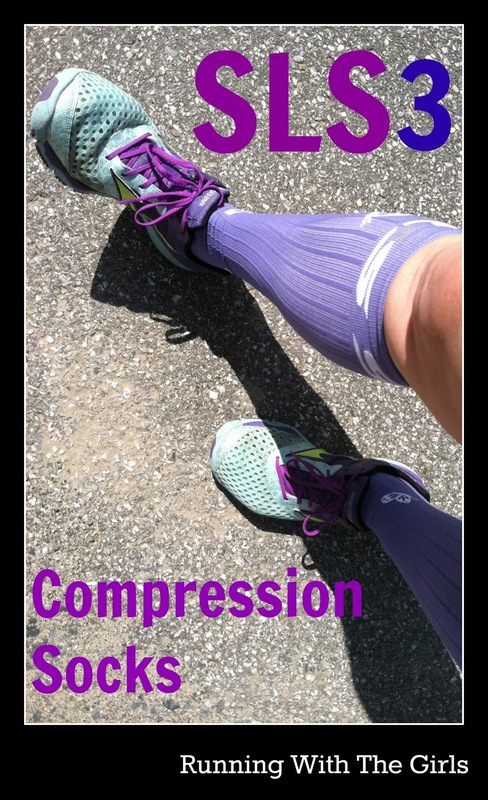 Are you a fan of compression socks? When do you wear your socks? All day? During workouts? Before? After? What do you look for in a sock? Disclaimer: I was sent a pair of SLS3 compression socks to review and as always, all opinions expressed on my blog are 100% my own. I have admired those socks, they are so pretty and I love the butterflies! Ha, I have sometimes put on stinky socks too because I really wanted that certain compression sock. I love the colour of those compression socks! So pretty!!! i have butterflies about this weekend too, although not for the same reason haha. youre gonna do great!! stay outta your head, focus, breathe, and believe! ill be thinking of you! and those socks are awesome!! I love compression socks after a long run or half marathon. They feel so good and prevent soreness from setting in. Great colors on yours! Those are so cute!! I've never worn compression socks too much since I haven't found a pair that fits well...need to look more! Let those butterflies fly you right through this race!!! I love compression socks, and yes to all of the above for when I wear them!